PhotosBlender is an app for combining photos horizontally, vertically or square using gradient blending at the seams where they are joined. What can PhotosBlender do for me? • Blends photos to create photomontages. • Blends vertically (up or down), horizontally (left or right) or perfect squares. 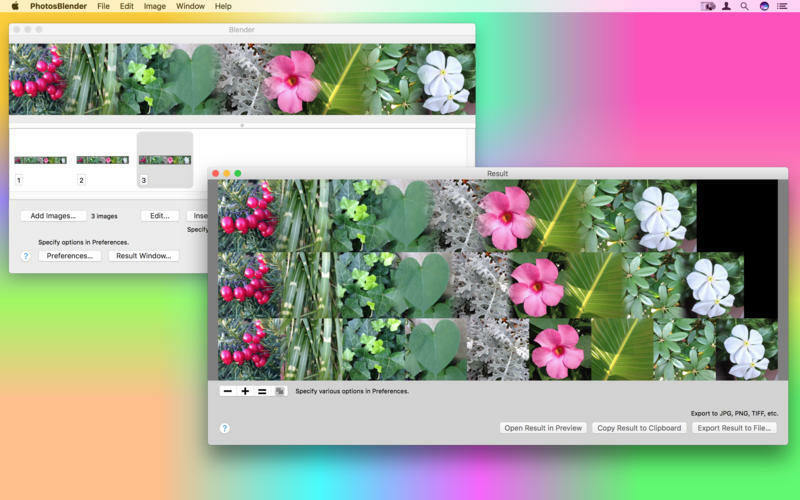 • Blend your blends to create arrays of blended photos. • Variable blending gradient or overlap. 1) Locate the files you want to blend in the Finder, Photos, or your web browser. 2) Drag the files you want to blend into the Blender window's "photo browser" at the bottom. Drag and Drop the files in the browser to reorder- drag in between each other, or swap them- drag one on top of the other. 3) Photos are blended using a blending gradient. You can choose the width of this gradient in the Preferences window. Set it to 0 to simply abut them. 4) Use the "Blend" button in the lower right corner of the window to blend the photos. If you quickly click the blend button the photos in the photo browser will be blended horizontally. To obtain the menu for selection of the vertical or square blend option simply click down on the Blend button until it appears. Square blends are for 4, 9 or 16 images, as 2x2, 3x3 or 4x4 arrays respectively. 5) When the blending is completed it will appear in the "Result" window. If the result is not what you expected, double check that the size and resolution of the images are similar. PhotosBlender will "trim" the result to match the width and or height of the smallest photo. If you want to create "arrays" of blended photos simply blend your photos horizontally first, saving each result, and then blend these results vertically. • Fixed an issue where some types of images were not blended at the right resolution, leading to low resolution output.